Ilove a good story, and all my life I have been connecting with heroes who inspire and motivate me. People who battle through the contradictions of life and swim upstream to make a mark on the world hold a special place in my heart. Someone once said that we are most impacted by the people we meet and the books we read. I believe this is true. So when I can I try and get two birds with one stone by reading a good biography. Recently I have been plunging into the biography of an amazing woman: Aimee Semple McPherson. Hers is a remarkable story on many levels. Here was a twenty-something mom who threw off the comforts of home, packed her two children, and set off to evangelize America at a time when women could not even vote. A woman preacher was unheard-of and in some quarters even unthinkable. She stepped out in faith and God rewarded her with one of the most powerful, far reaching ministries in church history. While her story is not without controversy, the fruit of her ministry is incontrovertable. It can be argued that this one woman made a bigger impact on her generation than any Christian in modern times. In baseball, a 5 tool player is someone who can hit for average, hit for power, run fast, field well and throw strong and accurately. Such players are rare. Aimee Semple McPherson was a 5 tool minister of the gospel, a superstar and Titan of the Christian faith. 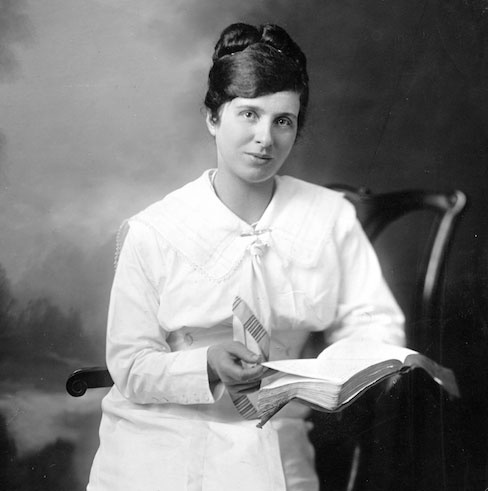 First and foremost, Sister Aimee was a passionate Evangelist. Born into a Salvation Army family and baptized in the Holy Spirit during the Azusa Street awakening, she was committed to bringing the whole Gospel to the whole world working with the whole Body of Christ. She refused to be boxed in by denominational loyalties. She had a passionate love for Jesus and for people.Tens of thousands of men women and children—blind, the deaf, the lame, were healed when she prayed for them. Reporters from the biggest newspapers across the country attested to the authenticity of her healing ministry. As a pastor she preached 21 sermons a week, established a Bible College and in spite of her non-denominational leanings, ended up spawning a denomination—The Church of the International Foursquare Gospel— that would plant missionary focused churches around the globe. Today there are 68,000 Foursquare churches in 136 countries. 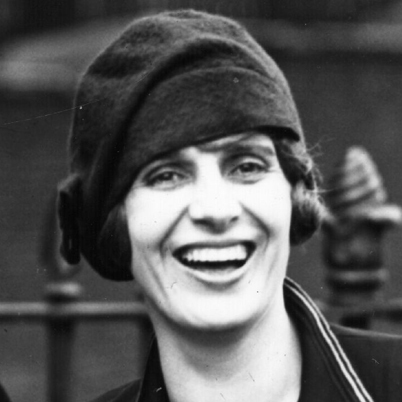 First and foremost, Sister Aimee was a passionate Evangelist. Born into a Salvation Army family and baptized in the Holy Spirit during the Azusa Street awakening, she was committed to bringing the whole Gospel to the whole world working with the whole Body of Christ. She made a splash everywhere she went packing out the largest auditoriums in the world, launching a media empire that was the envy of her contemporaries, and sharing the Gospel with celebrities and the people of the streets. As an envoy for the kingdom of God she visited with Gandhi, befriended Charlie Chaplin, personally encouraged her friend William Jennings Bryan during the Scopes trial and gained the respect of local and national political figures. She had a heart of compassion and brought women into her home who were pregnant out of wedlock, whether they came from brothels or troubled homes. She loved to bless and champion children, especially those who were less fortunate and at risk. One little girl that she dedicated to the Lord at a young age was Norma Jean Baker, a pretty little girl who had a very troubled life, had suffered sexual abuse as a child and was married for the first time at age 16. This young lady would later change her name to Marilyn Monroe. Sister Aimee championed and won the hearts of the police and fire departments in Los Angeles and made a huge impact on the untouchables of her society: the Ku Klux Klan and the Gypsies. Latinos and Black Americans loved her because they knew she cared for them. During the Great Depression her church became a more reliable source of aid to poor families than the State of California. 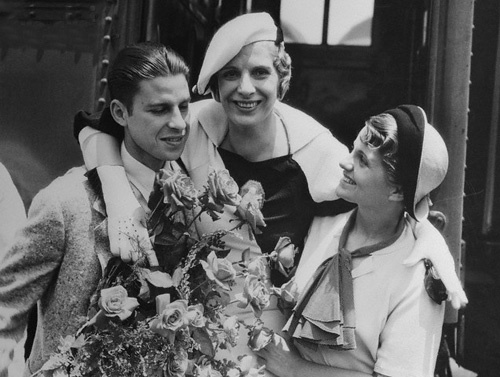 Aimee Semple McPherson was an optimistic dispenser of grace, showcasing in her sermons the love of God, redemption, the joys of service and the hope of heaven. This contrasted sharply with the fire-and-brimstone style of sermon delivery popular with many of her peers. People from all walks of life loved her and they flocked by the thousands to be where she was. The story of Aimee McPherson’s life was the story of a woman who pressed on, not afraid to step out and take action to meet a need, any time or any place. Because of her faith and courage millions of lives were changed for the better. And when she was thrown into the fiery furnace of slander and ridicule by the press, she stood strong. She didn’t get bitter or vindictive. She stayed consistent to her principles and let God fight her battles. Though the scars of misinformation and slander have marked her public persona in many circles to this day, those who take the time to read her story and investigate the facts will come away with genuine appreciation for this woman’s integrity. This was one courageous woman. Setbacks didn’t seem to phase her. There’s an old saying “No good deed goes unpunished.” We could add to that “No good person goes un-persecuted.” The same crowds that shouted “Hosanna in the Highest” and waved palm branches at Jesus’ arrival in Jerusalem screamed “Crucify him” just a week later. The same crowd that extolled Paul as a “god” stoned him just a few minutes later for his honesty and humility. So too did Sister Aimee face the furnace of affliction, beginning with her disappearance at Venice Beach on May 18, 1926. When Aimee turned up missing at the beach, the press spun it into a scandal rather than believe her story that she was kidnapped and held hostage. Instead of acknowledging yet another courageous moment in the life of this spiritual Titan who all her life had poured herself out for others, by covering her brave escape from captors, the liberal elite villainized her. They brought her before a grand jury which ended up being a kangaroo court hearing designed to entertain the press and public. They concocted unsubstantiated stories of her staging the disappearance so she could have a prolonged affair with Kenneth Ormiston, a married man with a small son who had worked as her radio technician at Angelus Temple. During the 1926 grand jury hearing that lasted 3 months, Ormiston’s privacy was invaded in every way as reporters and investigators tried to link him romantically to McPherson. Ormiston not only denied having romantic ties to McPherson, he also chastised the newspapers that their trying to make such a connection “was a gross insult to a noble and sincere woman.” It should be noted that Ormiston could have profited immensely from an exposé of such an affair with McPherson had it been true. The vindication of Mrs. McPherson and Mrs. Kennedy (Aimee’s mother) could not be more complete. 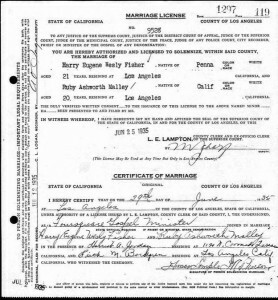 It is infinitely stronger than if it had been determined by a jury after hearing all evidence and resulting in an absolute acquittal…the State of California, with all its machinery, power and prestige, spent many thousands of dollars in the investigation of the truth of the charges which it had made against these women. These charges they admitted were all false…Seldom, if ever, in the history of American or English jurisprudence has so signal a vindication been achieved without a single gun being fired by the defendents in their own defense. The renowned journalist H.L. Mencken, no friend of evangelicals and previously a vocal critic of McPherson’s, came away from the trial impressed with Aimee and disdainful of the prosecution. Known as the “Sage of Baltimore”, Mencken is regarded as one of the most influential American writers of the first half of the twentieth century. Sent by the Baltimore Sun to cover McPherson’s trial, he concluded that that if you want to discredit somebody’s political agenda, then you go after their private life (now a fact of life for politicians but still somewhat new at the time.) Mencken concluded, with good reason, that she was persecuted by the Babbitts and official bullies of Los Angeles. Aimee understood this, and she took the high road. When the District Attorney who prosecuted her case was later sentenced to San Quentin on charges of taking bribes, she went out of her way to visit him in prison to encourage him and pray for his speedy release. This is the kind of woman she was. 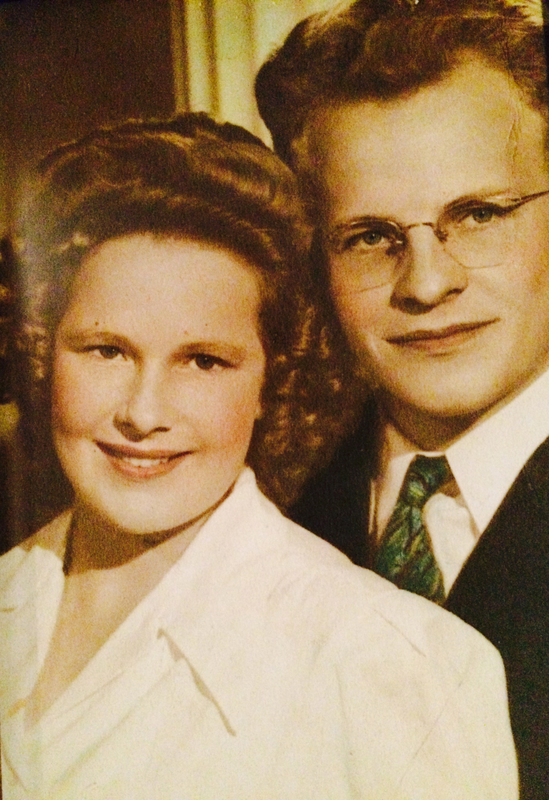 My parents, Dwight & Bonnie, 1943. Growing up I had heard of “Sister Aimee” through my parents. My mom and dad served under her ministry in the late 30’s and early 40’s. My mom and dad came to Christ under Aimee’s ministry, my mom at age 5 and my dad at age 18. Raised in Utah, he had grown up in a Mormon family with 12 boys and 2 girls. His oldest sister Nelda lived across the street from Angelus Temple, the 5,500 seat church Aimee built in the Echo Park area of Los Angeles. She found Christ through McPherson’s ministry and was an enthusiastic member the church. Aunt Nelda loved her little brother and wanted to share the Good News with him, so she invited him to come and stay with her in the summer of 1936. It was the summer that changed his life forever. 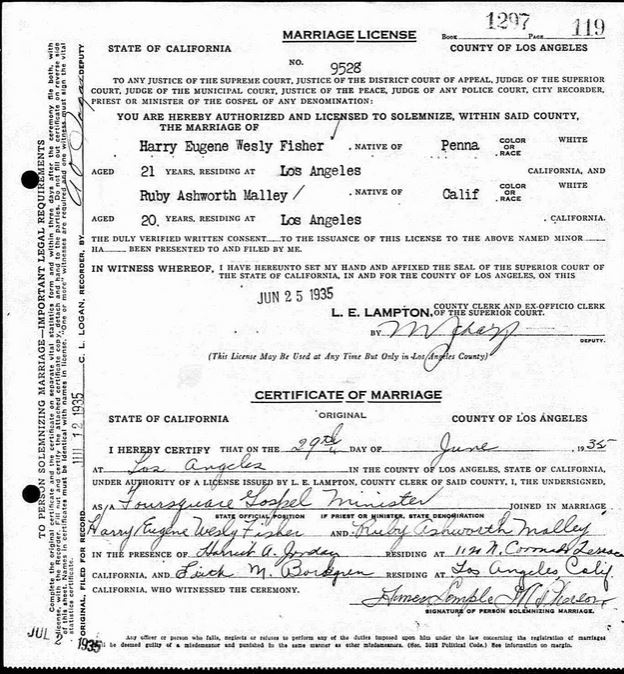 My Aunt Ruby’s Wedding Certificate, signed by Aimee Semple McPherson.